A monument has been unveiled in memory of 45 people who died when a flying boat crashed on the Isle of Wight 51 years ago. 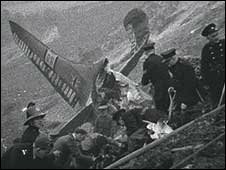 The Aquilla Airlines plane, carrying 50 passengers and eight crew, crashed into a disused chalk pit near Chessell on 15 November 1957. Forty-three passengers and crew died at the scene and two died later. A permanent memorial was dedicated to St Mary's Church in Brook, close to the crash site, on Sunday afternoon. 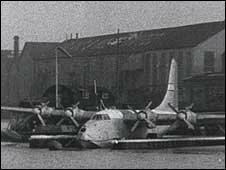 The plane, en route from Southampton to Las Palmas and Madeira via Lisbon, developed engine problems shortly after take-off and crashed at about 2250 GMT. Three honeymooning couples were among those who died. Ivor Passmore, of Ringwood, was rostered to work on the flying boat on the night of the disaster, but was taken off at the last moment. The news was broken to him the next morning. He told the BBC: "I swapped my trip with an engineer onboard because he wanted to take his driving test, and also his mother-in-law had died and he wanted to go to her funeral. "He asked me if I'd swap my trip and I said, 'yes sure Dave'. "We were down there seeing it off at 10 o'clock at night." Mr Passmore said the first he knew about the crash was when his landlady woke him in the morning to tell him the flying boat had crashed. He immediately went to the crash site. "It was a rather nasty scene, what with the 2,358 gallons of 130-octane aviation fuel all going up in smoke. "You can imagine that it was pretty horrific." Last year, a special service attended by survivors and relatives of those who died was held at St Mary's Church to mark the 50th anniversary of the crash.